Installing a solar power system can be a great way to save money on your electricity bills, while minimising your impact on the environment. More and more Australians are jumping on board with solar, but is it right for you? We take a look at what you need to know before you purchase solar panels. Solar panels work by utilsing the ‘photovoltaic effect’. This is the process in which photons from the sun project onto the solar panel, releasing electrons from atoms, generating DC electricity. Trapped by an electric field, these electrons flow in to an inverter, which converts the free flowing electrons in to useable AC electricity. There are three broad types of solar panels: Monocrystalline, Polycrystalline and Thin film. Each of these solar panels are built with crystalline silicon cells, however they vary considerably in efficiency and price. Monocrystalline:Sometimes referred to as single-crystalline, these solar panels are comprised of a one crystalline structure, given them a deep-black colour. Monocrystalline cells have the highest marketed energy efficiency at around 15%-21%, meaning they convert 15%-21% of the absorbed solar energy into useable electricity. Polycrystalline:Polycrystalline cells, also known as multi-crystalline cells, have a lower silicon purity than monocrystalline panels. This makes them more affordable, but less efficient, typically converting around 13-16%. But they are generally cheaper. Additionally, polycrystalline cells have a lower heat tolerance, making them slightly less efficient on very hot days. Thin Film:These panels are very cheap to mass produce, however they have very low energy efficiency, meaning they are not ideal for residential premises. The poor efficiency and ease of producing these panels makes them most ideal for commercial and agricultural properties where there is more room available. Which solar panel type is the best? Your solar company will most likely recommend monocrystalline panels, due to their higher perceived efficiency, however polycrystalline technology has improved dramatically in recent years, so it’s difficult to claim one type of solar cell is better than another. More important than the type of solar panel is its energy efficiency. Enquire with your solar installer about panel efficiency, and if there is negligible difference between the poly and monocrystalline panels, then your best bet will be the cheapest – usually polycrystalline. A single solar panel can produce as little as 40w, or as much as 400w. This means more panels won’t necessarily equate to more electricity. What you should instead be looking at is the solar system size as a whole. The system size is given in kilowatts (kW), as a measure of how much electricity the system can produce at peak output conditions (i.e. a perfect day with no clouds). So a 2kW system will produce 2kW for a couple hours a day in peak conditions. Many households opt for a 3kW solar system, which will require 12 x 250 watt solar panels. More or less panels will be required depending on their individual output. If you have a solar battery to store power or you have exceptionally large mid-day electricity usage, then it might be worth upgrading to a larger system. As a general rule, there is no need for a household to purchase anything larger than an 8kW system. If you’re unsure about what you need, send your solar retailer a copy of your electricity bill and they can probably recommend an appropriate system size. Watts to kWh – what’s the difference? It is important to recognise that kilowatts (kW) and kilowatts per hour (kWh) are not the same. A kWh is the standard measurement on electricity bills, while a kW is a measurement of energy consumption. If you run a 1kW appliance for an hour, it will use 1kWh. The less kW something uses, the longer it takes to use a whole kWh. For example, a 25 watt florescent light bulb would take 40 hours to use 1kWh. There is a general rule of thumb that the solar system size you need is equal to your electricity usage in kWh divided by four. To illustrate, let’s say you wanted to purchase a solar system which covers half your energy usage – around 8kWh. This means you only need a solar system of 2W. If you mistakenly purchase an expensive 8kW system, it would produce 32kWh – more than double your energy needs! Prices for PV systems vary widely and depend on a variety of factors including system size, location, technical specification and the extent to which end-user prices reflect the real costs of all the components. Technological advances and increased competition have significantly driven down the price of solar panels in recent years. The Australian Photovoltaic Institute (APVI) reports that in 2009, a 1kW system cost as much as $10,000. But in 2015, a 3kW system costs just $7,500 on average. Residential solar panel systems usually range from 1.5 to 8kWh, pricing anywhere from $2,000 to $12,000. Keep in mind, however, that there are also installation and system fees, as well as council permit fees for some areas. For eligible customers, Small-Scale Technology Certificates can help substantially reduce this price (elaborated below). If you’re getting a quote, be sure that the installer explain where all the charges are coming from, and don’t be afraid to shop around. What solar retailers are there? To see which accredited retailers operate in your state, visit the Clean Energy Council Website. What solar rebates are available? It’s a common misconception that the Australian solar industry ended with the Rudd era, however there still exist two great incentive schemes available for installing solar. They are the Small-scale Renewable Energy Scheme and Feed in tariffs. Under the Small-scale Renewable Energy Scheme, eligible customers who install a renewable energy generator (be it solar, wind or hydro), are entitled to a number of ‘Small-Scale Technology Certificates’ (STCs). The number of STCs you receive depends on the expected output of the installation over the course of its life time (15 years max), as well as the geographical location of the premise. You can calculate the number of certificates you are entitled to using the small generation unit calculator. To illustrate, a Sydney home which installs a 5kW solar system with an expected lifetime of 15 years in January 2016 will receive 103 STCs. These STC’s can be sold to electricity retailers, who are required by law to purchase a quota of STCs each year. The easiest way to sell these certificates is by allowing your installer to sell them on your behalf in exchange for a lower return. To maximise the value of your certificates however, they can be sold on the in an open market where price is determined by supply and demand. Alternatively, the STC clearing house will purchase certificates for a flat price of $40 per certificate. Solar panels alone are unable to store electricity collected from the sun, meaning any energy you don’t immediately use will feed on to the energy network. In exchange for this, your energy retailer and the state government will supply you with a feed-in tariff, which is a small rebate on your electricity bill for each kWh your solar system exported. The feed-in tariff you receive will vary anywhere from 4c to 50c per kilowatt hour and will depend on your location and retailer. There are no conflicts with local government bi-laws. For most of you reading, the short answer is yes. A report published by Solar Citizens in June 2016 found that solar systems are saving Australians around one billion dollars every year, with most systems eventually paying for themselves. Installing rooftop solar is now more affordable than ever, and the industry is showing no signs of slowing down just yet. While this might mean that rooftop solar prices will continue to fall, it may also lead to the removal of solar incentive schemes. 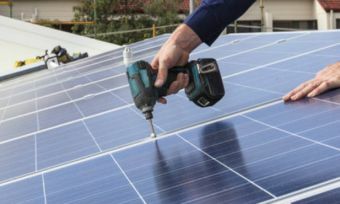 Solar has been hailed as the future of the Australian energy sector, so even if you don’t believe it’s right for you just yet, keep your eye out for great deals to come.